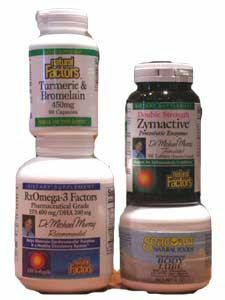 Natural Factors Chromium & Vanadium works synergistically to maintain a healthy body. Natural Factors Acidophilus & Bifidus is a powerful probiotic.This synergistic combination supports intestinal tract health and contains goats milk, an excellent growth factor for beneficial micro-flora. Pharmaceutical grade Pro Omega fish oil is a highly concentrated Omega-3 supplement containing EPA and DHA. Natural Factors Bromelain 500 mg provides natural support for healthy digestion.